It’s always good to see success rewarded! Last Week, Carrylift held there quarterly Sales Meeting which gave us the opportunity to recognise some of our hardworking team members for their successes. Mizzy Jordan in our North West region joined the sales team in January 2019 and has made a fantastic start, keep up the excellent work Supergirl and take care of the flowers. Tony Forrester from our North East region was presented with an individual award by our Sales Director Mark Brown, recognising the great work he did last year earning him Carrylift’s Salesperson of the Year for Combilift product. 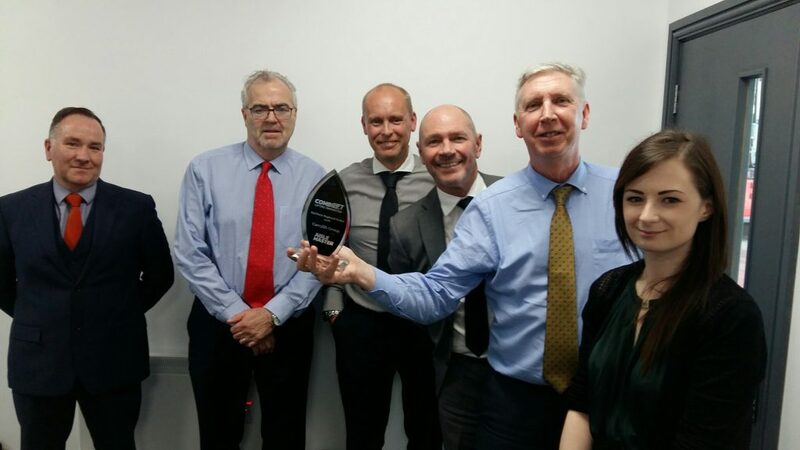 Finally, Our North West Regional Sales Team holding the Northern Dealer of the Year Award they received from Combilift for 2018 successes. We’ve made a fantastic start to 2019 and are looking forward to celebrating more successes in the months to come. Joined the sales team in January and has made a fantastic start, keep up the excellent work supergirl and take care of the flowers. Being presented with an individual award from Sales Director Mark Brown recognising the great work he did last year earning him Carrylift’s Salesperson of the Year for Combilift product. Holding the Northern Dealer of the Year Award they received from Combilift for 2018 successes.